Chicken Charmer: A Young Teen Builds a Nest Egg Raising Hens | One to Watch | Kids VT - small people, big ideas! A striking white peacock named Augustus greets visitors at the Greensboro farm where 14-year-old Axel McKenzie lives with his parents and two younger sisters. The bird isn't a typical farmyard animal, but then again, Axel isn't your typical kid. 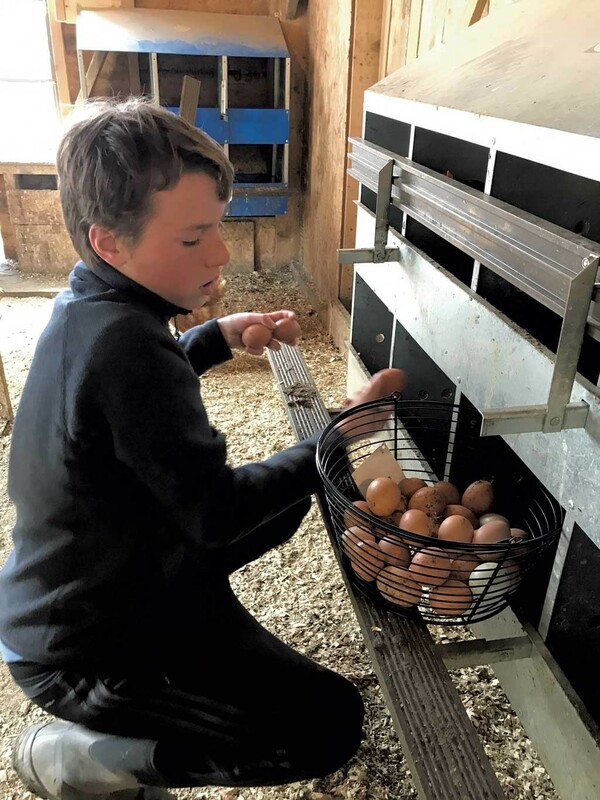 The eighth grader at Hazen Union School in Hardwick runs his own business, Axel's Pastured Eggs, which currently boasts a flock of 200 chickens, who lay around 9 to 10 dozen eggs a day. That's "an awful lot of eggs," acknowledges Axel. Customers can buy his eggs directly from the family farm or purchase them at Pete's Greens Farmstand in Craftsbury and Pete's Greens Farm Market in Waterbury. This year, Axel expects to sell $10,000 to $11,000 worth of eggs. "I've built a sizable nest egg," said Axel. "I really don't spend a lot. I have an iPhone and a MacBook Pro, but I try to save my money." On a sunny May afternoon, the teen offered Kids VT a tour around his family's farm, which is also home to two horses and three peacocks. Perched on a hillside, the barn includes one room outfitted with built-in nesting boxes and a chicken-sized door, which opens onto a fenced-in hillside pasture. 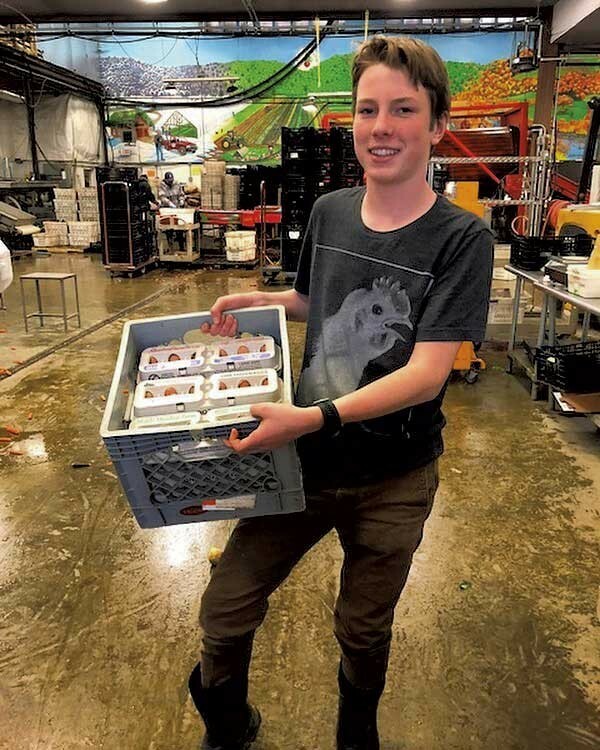 Beginning with half a dozen chickens, Axel started his egg business at age 6, when his family was living in Waterbury. He made flyers advertising eggs and left them on doors. Customers phoned in orders. "I had a little red wagon," Axel said, "and walked down the street to deliver eggs." When Tropical Storm Irene hit Vermont in 2011, Waterbury lay in its path. Axel and his parents packed the flock (which had increased to 30 birds by then) into cardboard boxes, loaded them into the trunk of their minivan, and drove to Burlington to stay with friends. "In the morning, a box broke, and the chickens got out," he recalled. "We had a grand time finding roosters in Burlington." Axel is quick to credit his parents for supporting his endeavors. "I couldn't have done this without them," he said. Mom, Amy Skelton, the business manager at Pete's Greens in Craftsbury, grew up on a farm in Maine. Dad, Craig McKenzie, spent his childhood in an apartment in Toronto and now works at Greensboro Bend's Jasper Hill Farm, which is renowned for artisan cheese and its state-of-the-art aging cellars. "My parents loaned me thousands of dollars," Axel said — a debt he repaid this year. In 2014, Axel's family moved to rural Greensboro because "my mom got sick of living in suburbia in Waterbury," explained Axel. The following year, with his parents' assistance, he built the nesting boxes in the barn and expanded to 200 chickens. Next year, the family has plans to expand their barn and grow Axel's business by 50 percent. Just how much work is Axel's egg endeavor? "I have to be on it," he said. He wakes at 5:40 every morning to feed the chickens. Twice a week, he washes eggs for about two hours after school. A few years ago, he invested in a $2,000 egg washer, a stainless steel contraption that attaches to the kitchen sink, to expedite the process. Every afternoon at 4 or 5 p.m., he collects eggs. Anson Tebbetts, Vermont's secretary of Agriculture, Food and Markets, visited Axel's family farm this May and accompanied him on an egg delivery. 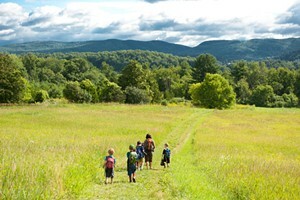 "Like many farm kids, Axel shows the best of Vermont," Tebbetts wrote in an email. "Axel works hard, takes care of his animals and produces a quality product." Despite his devotion to his egg business, Axel doesn't see it as a career path. He hopes to become a doctor one day. "Just because I want to help people," he explained. "I learned CPR last year. It just seems like a cool job. Farming is too, but it's a lot — a lot — of work." But, he continued, "I would definitely keep my peacocks. And I would have a small flock of chickens, like 10 or 20, wherever I go."